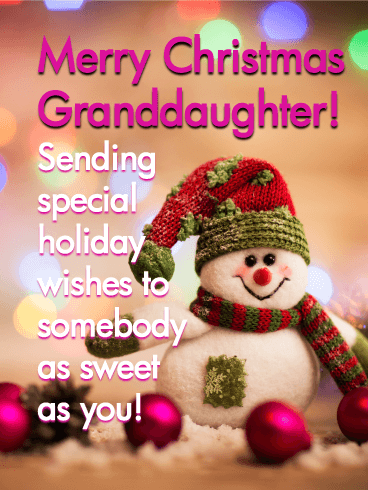 Merry Christmas Granddaughter! 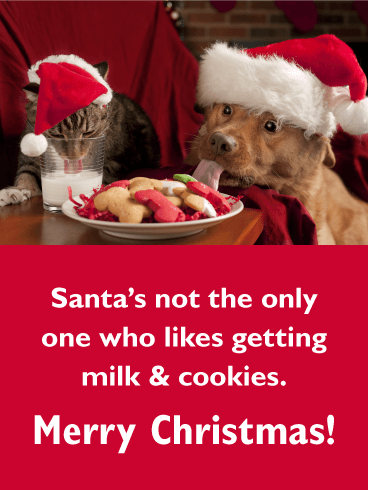 Sending special holiday wishes to somebody as sweet as you! 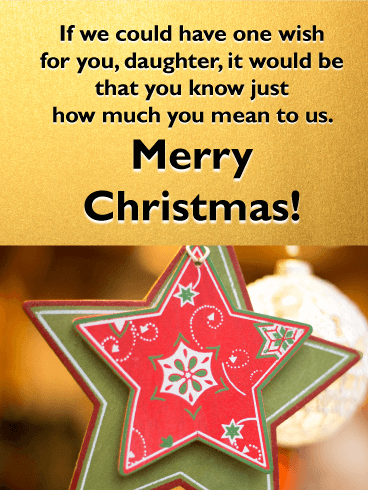 A charming star ornament against a gold background is a sweet way to wish your daughter a very Merry Christmas. 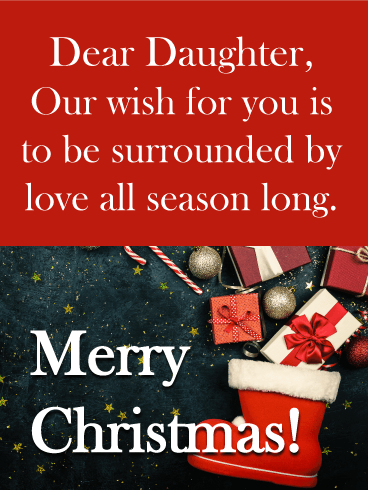 This card delivers a very important message for her: letting her know just how special she is and how much she means to the entire family each and every day of the year. Your daughter is such a special member of the family. At Christmastime, let her know how much she means with this beautiful card. A classic gift wrapped with a big red bow, along with ornaments and glowing candles, sets the scene for a magical holiday season. And the words remind her how wonderful she is, from the sparkle in her eyes to the warmth in her heart. No matter how old she gets, you want your daughter to always hold on to that childlike wonder at Christmastime. And this card is the perfect way to let her know. An adorable little girl in a Santa hat shakes a big wrapped gift, excited for what’s inside. And the words above express your wishes for her to embrace that magical feeling all through the holiday season. 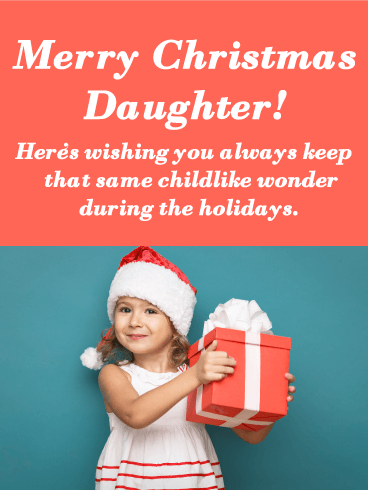 This touching holiday card for your daughter is the best way to say “Merry Christmas.” A family is busy wrapping lots of gifts, each holding a special one together. 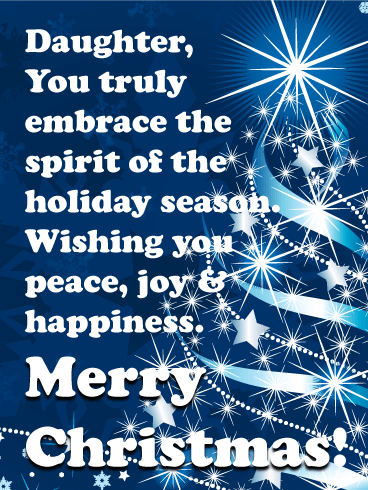 And above, the words wish her all the joy of the season. With its classic red and green colors and heartwarming scene showing the closeness we share this time of year, it’s a greeting that will make her feel loved and remembered. 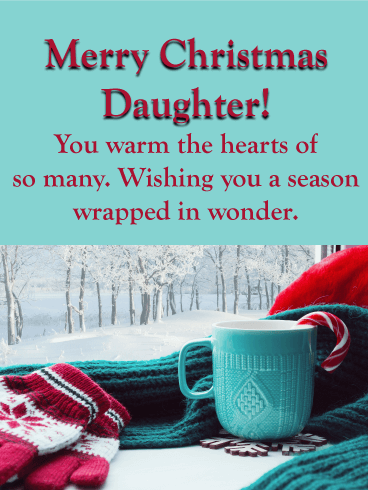 With a whimsical winter scene outside and lots of cozy things inside, like mittens, a scarf and a cup of cocoa, this Christmas card is sure to wrap your daughter in warmth and wonder this holiday season. A cool blue background against classic red type creates a unique color scheme for this special card, which reminds her how much she means to all the people around her, especially you. 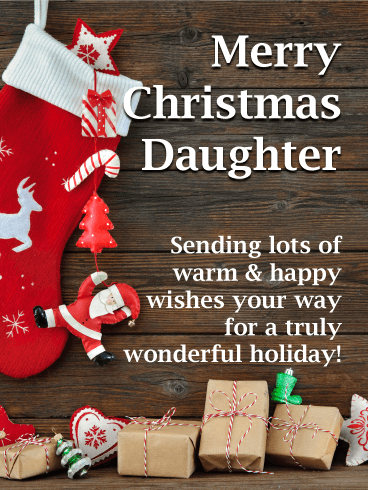 There are so many special wishes you have for your daughter, especially during the holidays. And this sweet card is a warm reminder of that. A stocking overflows with small wrapped gifts, candy canes and other festive touches below, while above, a touching message will let her know that you’re hoping she’s surrounded by love all season long. 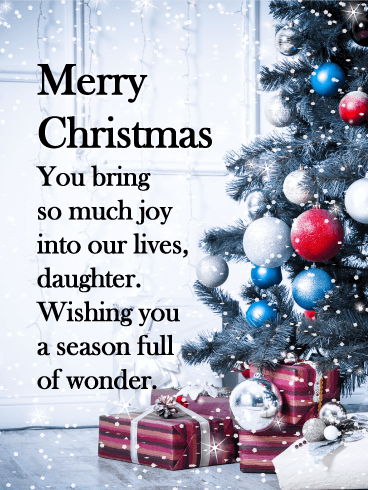 With its cool blue background and glittering tree, complete with a star on top and lots of snowflakes, this Christmas card to your daughter delivers a whimsical winter feel. 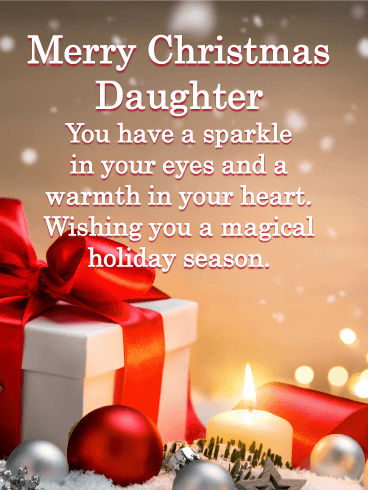 And the words are full of meaning, reminding her that she’s what makes the spirit of the season so merry & bright and wishing her peace, joy and happiness during the holiday season. There’s a magical feeling in the air this time of year, one that’s felt by everyone. 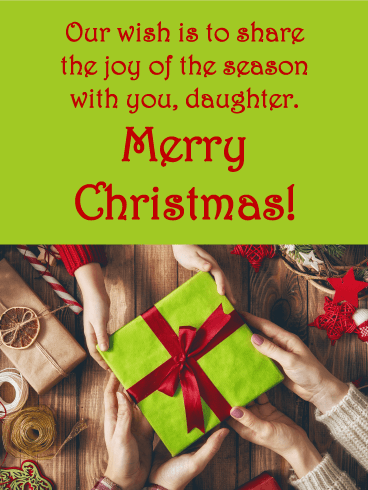 Share that joy with your daughter by sending this joyous card, featuring a beautifully decorated Christmas tree, whimsical lights and lots of presents underneath. 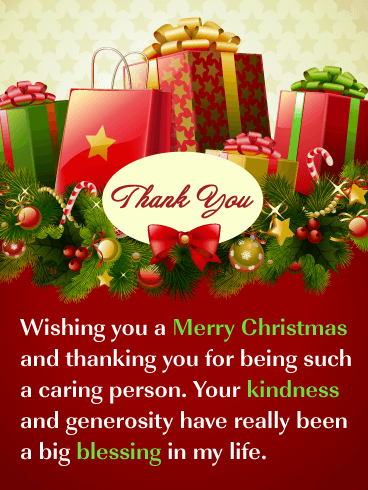 It’s a heartwarming way to remind her how special she is to you, while sending you best wishes for the holiday season. 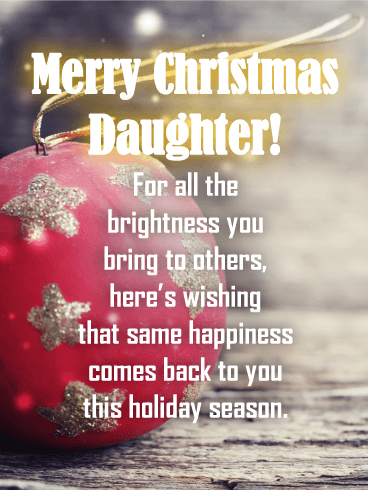 For the daughter who brings brightness to everyone’s life, this charming Christmas card is a wonderful way to let her know. A single red ornament decorated with stars in the background will remind her how much she shines, while the touching message will wish her all the happiness in the world during the holiday season.